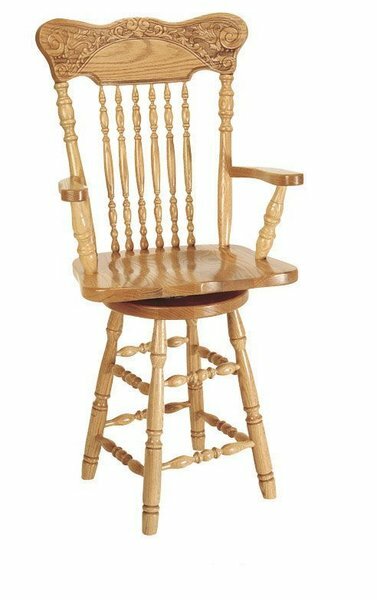 You've found a country style favorite and top seller with the Amish Pressback Turned Leg Barstool. These bar stools are a little frilly, with the elegant pressback design in the chair crown, decorative spindles and gracefully turned legs. Custom options are at your fingertips. Please email or call one of our Amish Furniture Specialists with any questions. We are happy to guide you through the customization process. Thank you for shopping at DutchCrafters. Height from Floor to Top of Seat: 24" or 30"
Height from Floor to Top of Arms: 32"
Height from Floor to Top of Back: 45 ½"